Product #2362 | SKU BEEQ700 | 0.0 (no ratings yet) Thanks for your rating! Finding it hard to get the perfect sound from your guitar? Maybe your guitar gets lost in the mix? Do you have major feedback issues with your acoustic? The problem’s not your guitar—you need an equalizer! The GRAPHIC EQUALIZER EQ700 provides total control over your tone and puts the brakes on annoying feedback, no matter what the performance situation. 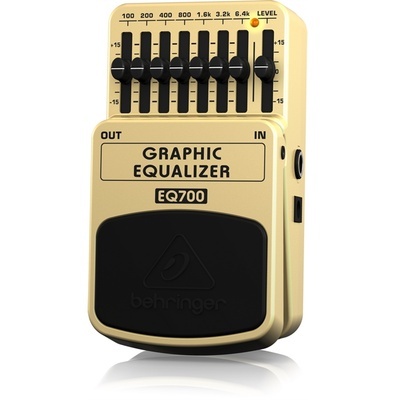 You can instantly improve the sound of your guitar with a little help from the BEHRINGER EQ700. With 15 dB of available boost or cut per band (that’s a lot! ), the EQ700’s seven frequency bands have been carefully optimized to provide the ultimate tools for EQing the guitar. Of course, to make full use of the EQ700’s capabilities, it helps to first understand some basics about the frequency range of your axe. Most performers don’t have a clue about what good equalization can do for their sound. Maybe you’ve heard the old maxim, “Make a sine-wave to get really good sound,” or “Make a smiley-face, that always works.” Sadly, this qualifies as advice from the uninformed. Just as every room is unique, so is every musical instrument. Even guitars made by the same manufacturer, using the same materials, on the same day can vary a great deal. A general rule of thumb—the best results are often achieved by finding and reducing the frequency bands that are offending, and then turning up the overall volume, rather than boosting one specific band.